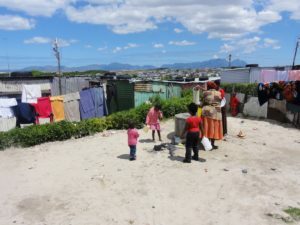 The vision of VPUU in Monwabisi Park is to build safe and integrated communities by upgrading the existing settlement without relocating people outside of the area. In Monwabisi Park very few children currently attend pre-school. In a settlement of about 25,000 people of which 11% are children under 6 years old (approximately 2700 children) there are only 417 children currently enrolled in ECDs in MP (baseline survey, 2009). It is not known how many are attending ECD outside of the area. As a result the ECD approach in Monwabisi Park is needs-based and area-based as opposed to demand-based and centre-based. The concept is that well-distributed ECD centres will provide between themselves ECD services to all children within the community. In this model each ECD centre would be responsible for the children within a defined area. They would be equipped and staffed to offer both the centre based ECD currently available, and the outreach ECD work using Emthonjeni within their assigned area. The outreach ECD work would be offered free of charge, and would be delivered in specially-designed public spaces. The ‘Emthonjeni’ spaces will be those public spaces. The utilities will draw adults to the site and so achieve two aims: safety and supervision for children, and access to education and health for children. 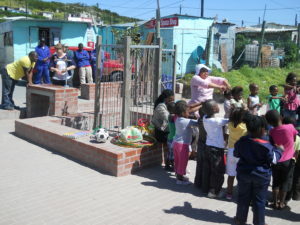 Emthonjeni is perceived as a multifunctional place for children to play and learn in a safe environment. It is also a space for adult socialising, and the provision of services and utilities including, where appropriate, water and clothes-washing point, which is the origin of the suggested name. The Emthonjeni project aims to deliver affordable, high quality universal ECD, achieved through a process which links revitalised ECD centres with small public spaces designed to support and encourage learning. Initially group and individual activities take place on the sandy surface or on mats. As the programme progresses low walls on which to work and sand-free clean hardened surfaces are constructed. A tree, an improved water tap or other small scale measures complement the design. 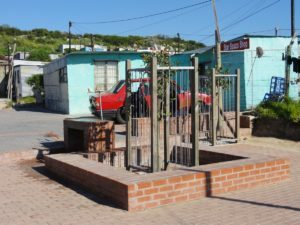 Without putting up structures or reducing public access to the space, this design, while it will not be able to end weather-dependency, will provide some shade from the sun and shelter from the wind, as these factors reduce the impact of Emthonjeni.